When you’re settling in to play the latest and greatest PC gaming release, you know how important it is to be comfortable. The right gaming desk can make all of the difference between a comfy gaming session or one that leaves you feeling aches and pains. Beyond that, you’ll want to make sure your gaming desk offers you plenty of space to hold your specific setup (along with plenty of room for drinks and snacks). Other important factors include the overall quality of the desk build and design. In order to make life easier for you, we’ve checked out a ton of gaming desks and narrowed them all down into this list of what we believe are the seven best gaming desks of 2018. 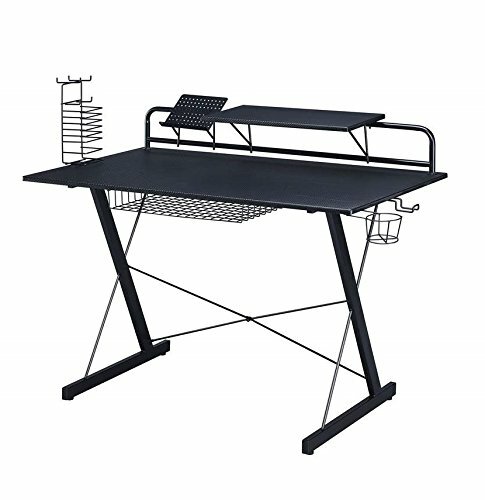 Why do I need a desk built specifically for gaming? What’s the most important factor to consider when buying a gaming desk? The first entry to make our list out of all of the gaming desks that we checked out is this multi-purpose computer desk made by the Office Oasis. While not built specifically for gaming (it’s also intended for use for general office work as well), it’s such a well-designed desk in general that it managed to earn a spot on our list. As they’re a smaller company, the Office Oasis sets themselves apart by offering top-notch customer service, as well as a damage-free guarantee for all of their desk deliveries. 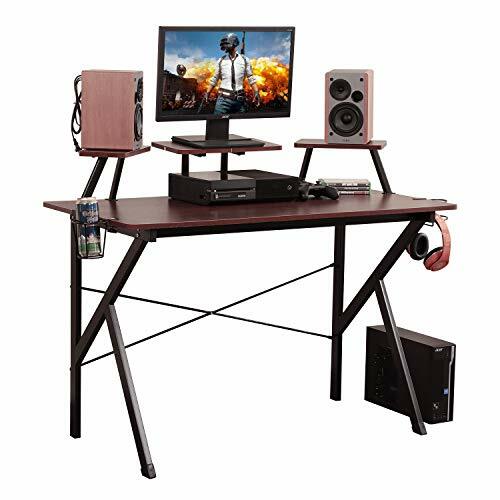 This sturdy desk is built high strength steel tubing that will have no problem supporting the weight of all your gaming hardware. Offering plenty of surface space, this desk also has a built-in cable tray organizer that helps to keep all of your cables organized. While this desk may look like your basic table desk, we were blown away by how well made and sturdy it is. The addition of the cable organizer is another great feature, along with the incredibly large amount of surface space – it works great for dual-monitor setups. Compared to all the other desks that made our list, this is the only entry that wasn’t designed specifically with PC gamers in mind. While it does a more than adequate job, we can only imagine what a quality desk the Office Oasis could put out if they focused solely on making a gaming desk. If you’re a little bit restricted when it comes to available real estate for your gaming needs, then you’re going to love the Atlantic Eclipse Gaming Desk, as it’s great for saving on space. Don’t let its compact design fool you though – with a carbon-fiber texture and cylindrical steel legs, this is one well-made gaming desk that’s more than deserving of your attention. The desk has a sleek black finish with a carbon-fiber texture laminate gaming surface, and powder-coated cylindrical steel legs. There’s also ample storage space for your speakers, headphones, VR headset, game controllers, or any other accessories you may have. And if all that wasn’t already good enough, there’s even a wire storage basket for your games and a power strip basket that helps keep your wires hidden. The biggest drawing point of this desk was undoubtedly how much space it can save you while not sacrificing on anything. The quality design speaks for itself. You can even adjust the additional accessory parts in order to customize the desk to your specific needs. Putting the desk together was more than a bit of a hassle as the included instructions were rather confusing. You also may need to keep a mousepad handy when using this desk, as the laminate surface doesn’t work very well with a blue light mouse. Next up, we have the Soges Gaming Desk, another product that has been built from the ground up with PC gamers in mind. Even with that being the case, thanks to some smart design decisions, this desk is also perfectly functional as a writing desk, or as an office workstation. But if you’re serious about your PC gaming in particular, then you’re going to find a lot to like about this desk. Considering that Soges specializes in wooden and metal furniture, it should come as no surprise that this desk features a fantastic design. It’s built with solid particle wood with a high resistance to scratches and friction, with a heavy-duty metal frame for the inner wall. 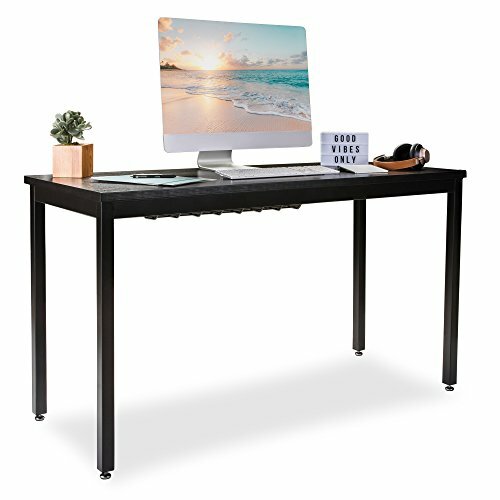 On top of its durable design, this desk also features three adjustable rising panels, a cup holder, and a headphone/VR headset hook that helps to keep all of your gear organized. We absolutely loved how customizable this desk is. Being able to adjust the rising panels as needed in order to support dual monitor setups and/or your audio system is great for clearing up more desktop space for you. And if you don’t need to use the panels? No problem -- they can be easily removed as well. To be perfectly honest, there’s not a lot that we could find to fault the Soges Gaming Desk for. The biggest complaint we could make regarding it is a common one that’s shared among many types of furniture products: the confusing setup instructions. Confusing setup directions in the included instruction manual. The fourth entry on our list of the best available gaming desks in 2018 is the Arozzi Arena Gaming Desk. At first glance, it appears to be about as basic as it gets when it comes to gaming desks. Don’t let that fool you though – this desk has been designed with gamers in mind and it definitely shows. The desk offers a TON of surface space, which will give you plenty of room to set up your gaming environment to be as immersive as possible. If you’re a gamer who enjoys having options, then you’ll have plenty of choice when it comes to this desk – it’s available in five distinctive colors. Aside from that, the desk is basic yet highly functional. It offers ample space to set up two or even three monitors, with plenty of room left over for your mouse, keyboard, and other accessories. There’s also a net underneath the desk for holding all of your cables to keep things more organized. The Arozzi Arena Gaming Desk proves that you can still make an incredibly good desk while sticking to the basics. It’s quick and easy to adjust the height of the desk, allowing you to feel nice and comfortable during those intense gaming sessions. When you buy this desk, Arozzi also throws in a rather high quality mouse pad with a microfiber cloth surface. As functional as a basic gaming desk is, it’s still nice to have the added accessories that some of the other desks on our list feature. Things like cup holders aren’t exactly make it or break it features to have, but they’re definitely appreciated. 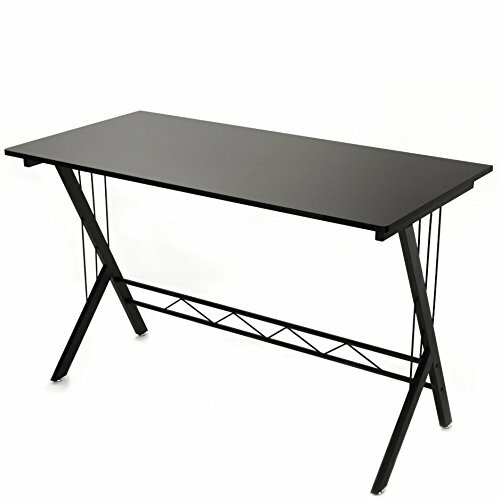 The BHG Gaming Desk Table is another desk that places an emphasis on having a clean, basic design. It’s been architecturally designed to provide an elegant look while simultaneously being a sturdy, well-made gaming desk. With a surface space that measures 47” x 24”, you can rest assured knowing that you’ll have plenty of real estate to hold all of your gaming hardware. The first thing that you’ll notice about this gaming desk is how incredibly stylish it looks. It will look great in your room – you’ll also appreciate how it doesn’t make your room appear ‘clunky’ or cluttered. Offering plenty of surface space, the desk also has a built-in headphone/VR headset holder for your convenience. Our favorite thing about the BHG Gaming Desk Table was easily the fact that it offers a rather large surface space while still appearing to not take up too much space in your room. Aside from that, there’s no denying that it’s quite an elegant looking gaming desk. And unlike some of the other gaming desks that made our list, BHG actually provides clear, concise, easy to follow assembly instructions. Unfortunately, the one downside of this gaming desk is a pretty glaring one. After setting it up and placing your gaming hardware on it, we noticed that it’s quite a wobbly desk from side to side – something to keep in mind if you plan on setting it up in a room with carpet flooring. Can be quite wobbly from side to side on carpeted flooring. Number six on our list is the Jamesdar Carnegie Gaming Desk. All it takes is one look at this desk to realize it was definitely developed with an eye towards PC gamers. It’s been designed to appeal to gamers above all else – everything has been strategically placed to enhance your entire gaming experience. It’s a great choice for gamers looking to keep all of their hardware organized without having to get a desk that takes up a lot of space. 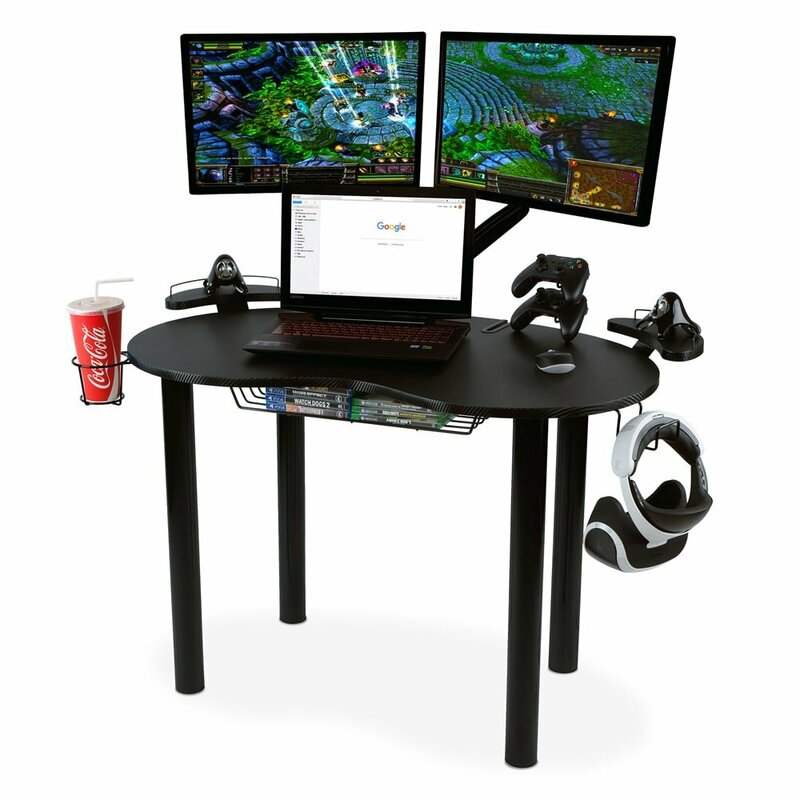 Jamesdar markets this desk as ‘the ultimate gaming desk.’ After trying it out, we can honestly say they’re pretty much right on the money. The desk features an adjustable monitor shelf, convenient speaker stands, a cup holder, and an underside storage bin for holding your accessories. If there’s one thing that’s immediately clear with this desk, it’s the fact that Jamesdar definitely understands the needs of gamers. Everything about the desk just clicks perfectly thanks to the smart accessory placement. We also appreciated having the option to remove said accessories if you desire some more space for dual monitor setups. While the desk is incredibly functional, it admittedly does have a rather cheap look. We weren’t a fan of the wood veneer finish. Other than that, we could have used with just a bit more surface space without having to remove the attachments – but the available space that is there isn’t a deal breaker by any means. Closing out our list of the best gaming desks of 2018 is the Techni Sport Gaming Computer Desk. Techni have honestly made a brilliant desk with this product. It only takes one look at it and you can tell that it’s a desk designed to make gamers smile. It’s to be expected though as Techni are also responsible for making some of the most comfortable gaming chairs we’ve ever seen. They definitely have a knack for constructing comfortable gaming furniture. 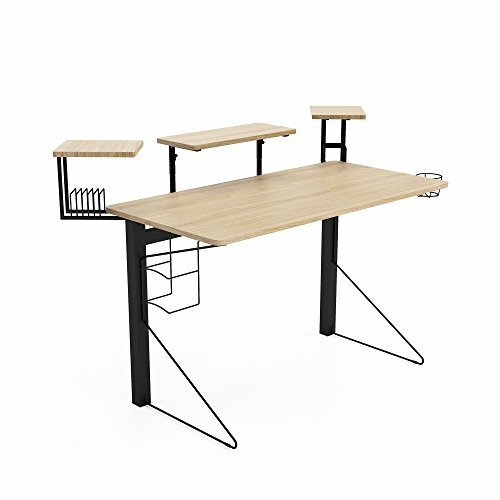 The desk has a sleek black appearance thanks to its carbon fiber laminated MDF top and durable steel legs. There’s also plenty of surface space that can easily hold your monitor, tower, laptop, mouse, keyboard, and whatever other gaming gear you might have kicking around. There’s something about this gaming desk that just made us feel like we were in the zone whenever we sat down at it and fired up a game. It had plenty of space available to set up two monitors. It even has all of the optional extras that make life more convenient for gamers, such as a cup holder and wire storage racks. Aside from all of that, it also just might be the most comfortable gaming desk we’ve ever used. There are quite a few design choices with this desk that will make you scratch your head. The game holder rack has several differently sized slots. There’s no cable tray to help keep your cables organized. That’s just nitpicking though, as they’re minor annoyances compared to everything else that the desk gets right. If you’re in the market for a brand new gaming desk, it’s definitely of the utmost importance that you choose the right one for your specific needs. This is especially true when you consider that you could be spending dozens (or even hundreds) of hours of gaming time sitting at your desk. With that in mind, we wanted to go over some of the most important things you should be looking for when shopping for a gaming desk. When it comes to gaming desks, you should be prioritizing comfort above all else. We mentioned above how you could potentially be spending hundreds of hours playing games at your desk – you’ll definitely want to go with a desk that features a streamlined ergonomic design. Another important consideration to make is how much surface area your gaming desk will provide you. Many gamers these days sport dual monitor setups along with a custom-built tower that they proudly display. You’ll want to make sure your desk has enough surface space available to comfortably (again, it all goes back to maximizing your comfort) hold all of your hardware. Building on the point above about having enough desk space to hold all of your hardware, you’ll want to make sure that your gaming desk is sturdy enough to carry all of that extra weight. The good news is nearly all dedicated gaming desks are built with that in mind – yet another reason to go with a desk built specifically for gaming instead of a cheaper generic option. Many gaming desks these days are designed with a few extra bells and whistles that are intended to make life just a bit easier for gamers. You can find gaming desks with built-in drink holders, dedicated speaker holders, and many other optional features that aren’t necessarily essential – but everything else being equal, most people tend to go with the desk that offers them the most convenience. There are quite a few reasons why it makes sense to have a separate desk for all of your gaming needs (especially if you share your living space with a significant other). For starters, if anyone else in your house needs to use a computer for getting any work done or something like that, your gaming session won’t be interrupted. Likewise, keeping your gaming desk separate from your office desk makes it less likely that you’ll get side tracked by firing up your favorite PC game when you need to be productive. It’s also great to have a dedicated space where you can freely set up your monitors, keyboard and mouse, and your tower. And as we mentioned earlier, you can rest assured knowing that gaming desks are built to handle all of that extra weight you’ll be stacking on. As we’ve stated multiple times throughout this article, we firmly believe that gamers should prioritize comfort first and everything else second when shopping for a new gaming desk. The right gaming desk combined with the right gaming chair can go a long way towards making sure you stay pain and injury-free after those lengthy late night gaming sessions. While all of the gaming desks that made it onto this list are more than worthy of your attention, in the end there could be only one gaming desk that earned our top recommendation. The Techni Sport Gaming Computer Desk isn’t just the best gaming desk of 2018 – it’s one of the best gaming desks we’ve ever had the pleasure of using. Everything about the desk just feels so right, resulting in a gaming experience that was as comfortable as it was immersive. It also has you covered with all of the extra bells and whistles that provide a ton of convenience so you can keep on gaming for longer. 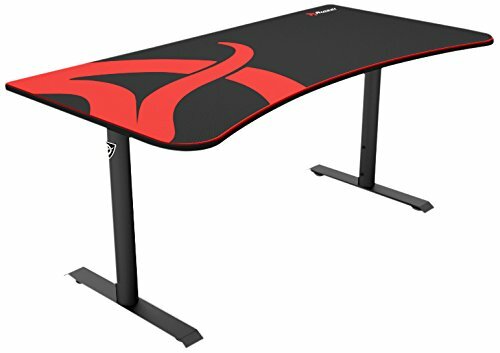 And even if you aren’t planning on using this desk for gaming, it’s still an easy recommendation to make for anyone in the market for a computer desk in general.